A Portal offers the possibility to present different applications such as standard software, individual components or websites in a consistent way. A Portal Server such as Liferay Portal must be used in combination with one or more web-frameworks. The effort is huge, because you have to use a Portal server, create portlets and implement the communication between different portlets. A Portal does not make sense for a small web application - e.g. if you want to realize just a little CRUD Client, then a Portal Server and Portlets are oversized. Complexity implies the view of a Java developer! Therefore, it is much more complex and time-consuming to learn e.g. Grails because you have to learn Groovy first. JavaFX: The new JavaFX (which will be released 2011 with a Java API) is meant here. Adobe Flex does not compile Java bytecode. Due to missing alternatives for a RIA in 2010 (besides the old JavaFX without Java API, bad IDE support, and so on), it is added nevertheless. Flex can be integrated with JEE by using tools such as GraniteDS. I cannot tell you, why JSF is a little bit above Wicket or Tapestry. The intention is to give an overview and a categorization, no flame war. So you also could put JSF a little bit below Wicket and Tapestry. Does not matter! The same is true for the other frameworks. Key Message: Right Tool for Right Job! The key message is: Use the right tool (i.e. web framework) for the right job! 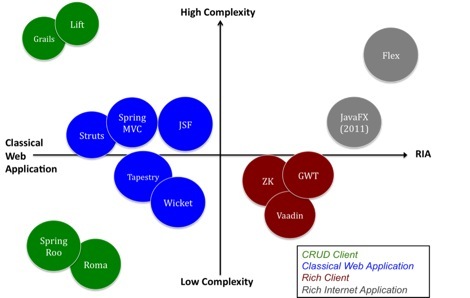 ... a classical web application, choose JSF or Wicket or Tapestry if you want to use a component-based framework. Use Spring MVC or Struts if you need an action-based (also called request-based) framework. ... a RIA, you have to use Flex or JavaFX, because none of the other frameworks offers the possibility to realize a modern looking application such as Pokerstars at the moment. ... a Rich Client, you have to evaluate if you need a client-centric framework (such as GWT) or a server-centric framework (such as Vaadin or ZK). ... a CRUD Client, you can realize it with every framework. If you want to realize it with high productivity, you should use a framework which is constructed exactly for this. If you are a good Java developer, you can use Spring Roo or the Roma Meta Framework. Grails (using Groovy) or Lift (using Scala) are good alternatives, if you are familiar with a „modern“ JVM language or if you want to learn that language. ... a Portal, you have to do much more work. Choose a Portal Server, use Portlets, and choose your web-framework. For this purpose, JSF could be a good choice in the majority of cases, because good (and standardized) bridge implementations are available. But other web-frameworks offer "integration plugins", too. I showed you a categorization of web-frameworks in the Java / JVM environment, considering different types of web applications. I hope this is a good overview. Discussions are welcome, but please do not start a flame war. Do not tell me that JSF is better than Wicket because of XYZ. But of course, tell me if you do not like this categorization considering different types of web applications. Tell me if some important framworks are missing or if anything else is in your mind besides a flame war.